Last year I went shopping with my older sister when she was in town visiting. We have really amazing antique shops in the historic part of our town here, and when she visits we try to hit them all. I wanted to share one of my finds that day. 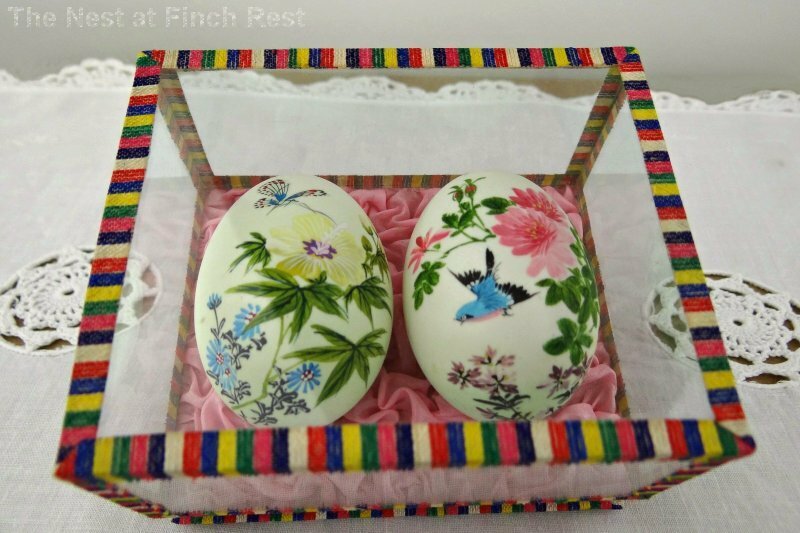 It is the most exquisite antique colorful pair of hand painted eggs, displayed in a very unique unopenable glass box. The colorful trim looks like linen or cotton, some kind of weave. I didn't enhance colors, it truly is this bright and cheerful! Sorry about some of the glare - could scarcely seem to avoid it. Anyway, that's it - pure and simple! Have a wonderful weekend - filled with all sorts of miracles. Those eggs are stunning!! And the box is quite interesting in and of itself. Such vivid colors on the edges. Wow what a wonderful find. I can see that you and your sister had a fabulous time together! Hope you and your family will have a beautiful Easter Weekend. Wow, those are beautiful, Michele! The colors are great and I love the way the fabric was put in that they are laying on. How beautiful! You should link this post to Pink Saturday, too ~ they're having an Easter theme this week. I just love your blog header, too ~ simply gorgeous. The colors are stunning and beautiful! A lovely find. How fun to go with your sister and have such a good time. Hope you have a wonderful weekend Michele! How fun! What an unusual find! How fun to go antiquing with like minded ladies!!! What a great find! The colors are beautiful. What a great find. Gorgeous! I hope you'll link your post to Seasonal Sundays. :-) so cheerful perfect little painted eggs! Do pop by and say hi if you have a sec. These eggs are stunning! I've never seen an egg with such detail, so perfect. Thank you for sharing on Simple & Sweet Fridays. 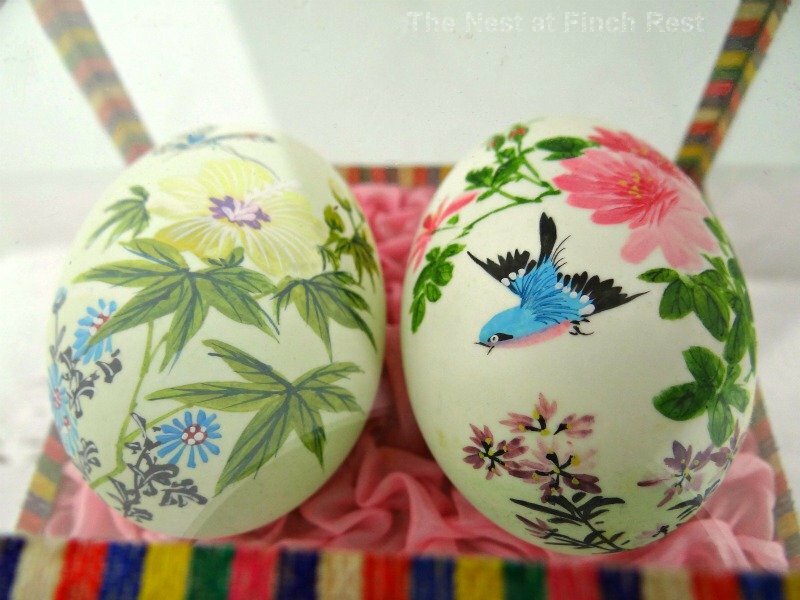 What a beautiful set of antique, hand-painted eggs. Wishing you a Blessed Easter. Those are gorgeous! Thanks for joining Color Connection. A magnificent creation you had here. 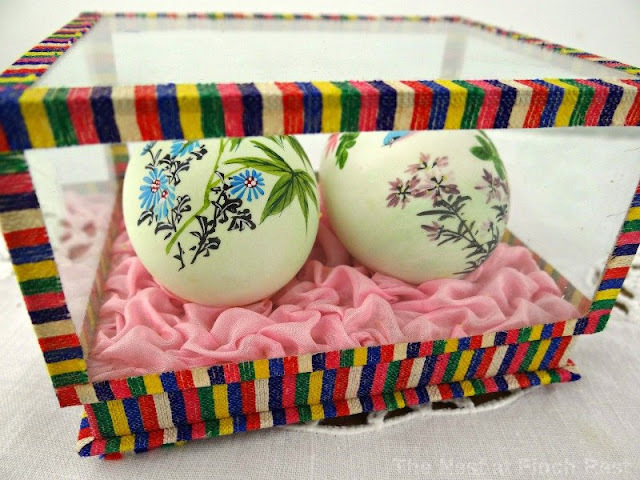 I am really amaze by your antique colorful pair of hand painted eggs and it is displayed in a very unique unopenable glass box. It is very pleasant to our eyes. You are so creative.